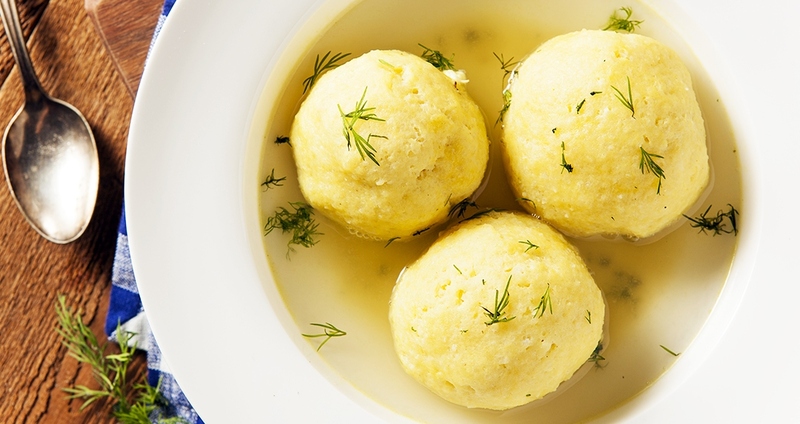 This Paleo Rosemary Matzo Ball Soup recipe is a delicious and healthy way to celebrate Passover. Almond flour is used to create matzo balls that are gluten-free and perfect for those following a grain-free/paleo diet. If desired, this soup can be made heartier by adding 2 cups of a cooked protein source (e.g., shredded chicken, or garbanzo beans for a vegetarian version). Combine the eggs, 1 teaspoon of sea salt, almond flour, granulated garlic and rosemary together in a mixing bowl. Set in the refrigerator for one hour to allow mixture to firm up. Once almond mixture has had time to sit, begin making the soup. Add the coconut oil to a large pot over medium heat. Add the onions, garlic, parsnips, carrots and celery and sauté for about 10 minutes, until onions are translucent and vegetables are becoming tender. Add the broth and 1 teaspoon of sea salt and bring to a boil, then lower heat to a simmer. Simmer for 20–25 minutes, or until vegetables are tender. While soup is simmering, fill a separate medium pot with water and bring to a boil. Divide the almond mixture into twelve approximately 1-inch balls and add the matzo balls carefully into the water. Cover, lower heat to a simmer and let cook for 20 minutes. When ready, pull the matzo balls out using a slotted spoon or tongs. Divide the matzo balls and vegetable soup between six bowls and serve. Top with black pepper to taste.